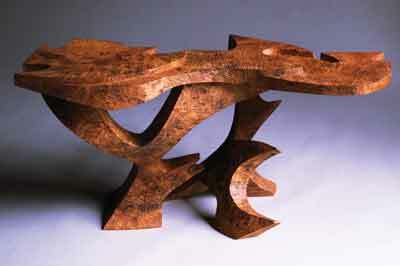 David has explored freestanding and wall sculpture as well as sculpted tables over the last 35 years. 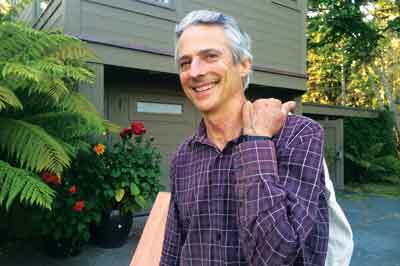 He pays special attention to form and line and mainly sculpts in myrtlewood (Umbellularia californica), which he finds washed up along the Pacific Northwest beaches. David carves each sculpture using a chainsaw while the wood is still in its green state and he finishes his surfaces with a concave shaped chisel, which helps to emphasise movement and energy in the overall sculpture. David Groth: Currently I am working on two sculptures, approximately 1.8m wide, that hang on the wall and three freestanding pieces, at approximately 915mm tall. When I am working on tables my thought process and carving technique are the same as my approach to sculpture. The tables require level and flat surfaces, so these surfaces are chisel finished in such a way that a glass can set without tipping. DG: I wouldn't like to imagine having to carve without all my shaping and finishing tools... but what an imposition without the tool that removes the most wood the quickest... this would be an assortment of chainsaws. DG: Of course a chainsaw... and before that another chainsaw! I find that they tend to wear out much quicker than my chisels. DG: More than 30 years ago, I saw a table by Isamu Noguchi, at the Los Angeles County Museum, that crosses the bridge between sculpture and furniture. An inspiring moment realising there doesn't need to be separation from sculpture, while creating a functional piece of furniture. 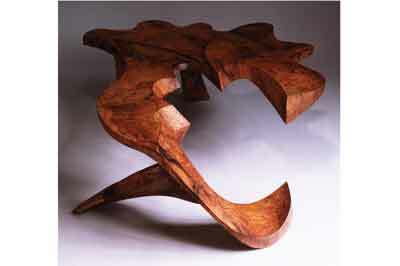 DG: Whether I'm working in sculpture or sculptural tables, my attraction to creating form allows me to express a dimension of myself that is challenging and at the same time fulfilling; it requires my ability to always explore with fresh eyes new possibilities each time I begin a carving. DG: Creating sculpture has been the path for exploring my own vision and putting into 3D form the way in which I perceive the world. For the last 30 years an important aspect of my work is reclaiming California bay, also known as myrtlewood, from the beach, after storms and high river water washes trees to the ocean. Rather than cutting trees, I am able to reclaim carving wood from beaches near my home. DG: Growing up in a household where both my parents were artists was certainly an influence on my development as an artist. My father's masterful attention to design and freedom of expression and my mother's sensitivity to her subjects, along with her amazing intuitive use of colour were eye-openers for me, concerning the complexity involved for me to arrive at the point of successfully expressing my own point of view in artwork. At the moment I have great appreciation for Jackson Pollock's freedom to explore new horizons and simultaneously his ability to control what seems at first glance chaotic expression. Also, I love Isamu Noguchi's creativeness with form and his sensitive handling of polished and textured surfaces. DG: The foremost element I've always kept in mind and the common ground shared by all my expressions in wood is attention to form and line. Instilling personal vision and exploring form is uppermost in my mind throughout the transformation from tree to finished carving. DG: How and where I exhibit my work is always in transition. My work has been shown and sold in New York, Los Angeles, San Francisco, Chicago, etc. Currently I show work with Del Mano Gallery in Los Angeles and on my website. F&C: How comfortable are you working to someone else's design? DG: All of my carvings are one-of-a-kind sculptures... I just can't help myself when it comes to exploring the potential of each unique piece of wood. Because of my creative enthusiasm I shouldn't be turned loose to botch someone else's design. DG: After reclaiming timbers between storms and after rivers have flooded, working intuitively, I allow the form to evolve as I carve. When a piece starts growing I grow with it, I have no preconceptionsâ€¦ it is part of a stream. I find this intuitive approach both challenging and rewarding because it requires complete focus on the creative process unfolding at hand. DG: Personally there is no division between artist and craftsman in my approach to creating a finished piece. Both personal vision and appropriate and skilled execution must be combined for a work to be successful. 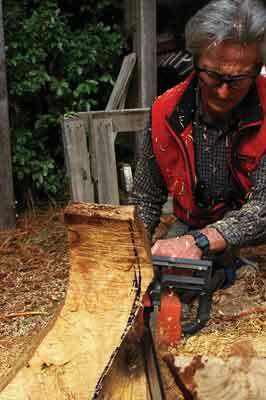 DG: I carve each sculpture by chainsaw while the wood is still in its green state. After roughing out the form it is then kiln-dried for between three and five weeks, depending on its size and thickness. When the sculpture is completely dried I refine the shapes with a die grinder and finish the surface with chisels. The sculpture's surface is coated with a mixture of beeswax, boiled linseed oil and polyurethane. DG: As long as people need a place to sit and a table to eat from and enough of those people appreciate quality in expression and design there will always be a place for expressive and skilfully made furniture.